Apex International is the leading manufacturer of anilox and metering roll solutions in the world and also the exclusive distributor of the Bellissima DMS Screening. Apex products are used in the Flexographic printing industry as well as the Offset, Industrial Coating and the Corrugated industry. 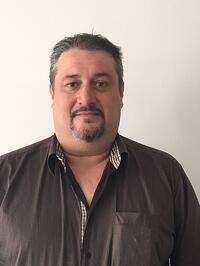 As of September 3rd, Pascal Bouileau has been appointed as Technical Sales Representative for the North Western part of France. Since 1995 Pascal is active in the printing industry and throughout the years he has created a wide expertise on several positons. His experience as flexo printer and colourist together with his know how on ink management and technical sales of ink, will create additional value towards the Apex customers and his goal is also to enhance the level of customer service. Apex International is a global leader of anilox, glue set, and metering products and print maintenance solutions. With 5 production facilities on 4 continents, a strong portfolio of clients in over 80 countries and a high-performance continuous improvement culture, Apex’s value proposition is founded on developing solutions to satisfy the complex print challenges our customers face every day. Apex is also the exclusive reseller of the Bellissima DMS Screening worldwide. Marketing Assistant, Apex Europe B.V.